First stop is Trader Joe’s, which donates six boxes of fruits and vegetables. Next, Eastern Standard Kitchen & Drinks, where chef Jeremy Sewall provides three pans of prepared food: beef and rice, risotto, and fruit salad, all untouched from a restaurant event. From there, the van heads to the Boston Rescue Mission on Kingston Street near Downtown Crossing. Until recently, the Rescue Mission and other hunger organizations rarely received fresh produce. Now it does, thanks to Ashley Stanley and Benjamin Delfiner of Lovin’ Spoonfuls, which Stanley launched in January. Charles Sommers, the food service director there who feeds about 200 people a day, hugs Stanley when she arrives. 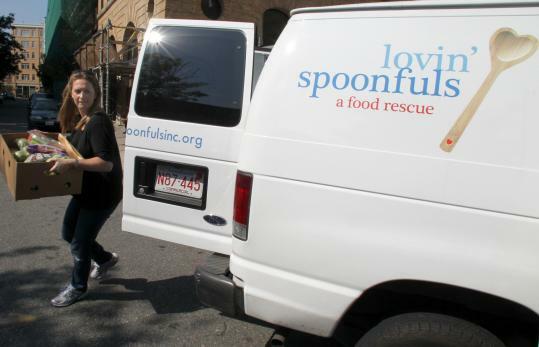 For more information on Lovin’ Spoonfuls, go to www.lovinspoonfulsinc.org.